Finally after so long we have nearly finished testing of our new 6 pot calliper. We had contracted Delphi to design and manufacturer this monster and has been on track in testing for the past three months. We will be ready to release this package for sale in coming weeks. Next is the 4 pot rear upgrade to match the front. Too much fun at Sandown and the Island on these brakes. What size rotor are you using? The disc is our 355mm x 34mm radial vane disc mounted on alloy hats. How are the calipers for thickness comparative to the Brembo 6? Same question for the rear 4 pot. Will the callipers fit in the stock position or would a bracket be required to mount these? Also, how long do you think it will be before they're ready for sale? The 4 pot rear is being designed now so will have that info after we finish. Last edited by Shockworks; 06-03-2017 at 10:41 AM. The calipers come complete with dogbone to suit the Ford knuckle so bolt on in the original position. Is it too early to ask for more facts/features ? Any difference to the current brembo and other 6 pot brands ? or same same ? Caliper colour (silver as pic) and branding ? 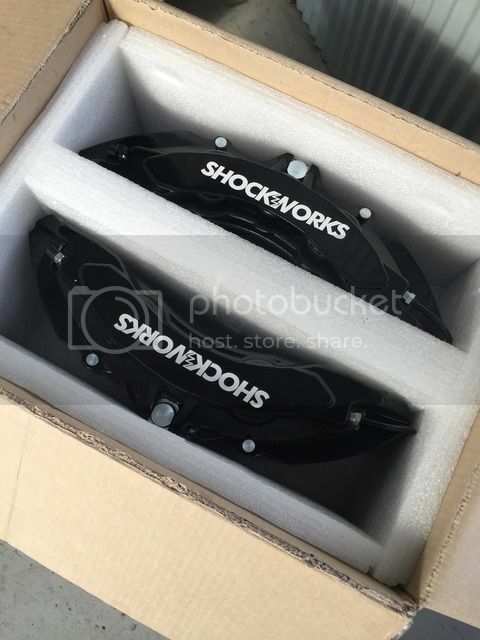 will the caliper decal be Shockworks ? or you have some other name ? Looks a very impressive package. With the critical aspect of braking integrity, have you sorted out the cracking that occurred to the floating rotors at the stud jointure area. Have you redesigned the floating stud so that it is not "open" on the front hat side causing forces to be transmitted through the stud resulting in cracking of the disc. Comments on any design changes to the disc and hat stud joints since the failures involving members of this forum would be appreciated. Ford Festiva 1.3 - married-still alive??? At this stage we will not be offering the floating disc option with the 6 pot brake upgrade. We have had two discs with the floating assembly show some small cracks which were using the Brembo caliper and unknown competition pads. Inspection showed uneven wear on inside of disc resulting in excess heat of the inner disc area. We are still using the floating disc on our test cars and many race cars with no issues at all from any other discs or vehicles. Our test car with the 6 pot calipers and 355 floating disc has been on track for three months. At the Island we are achieving 270kph down the front straight and 252kph at Sandown and running 12-15 lap sessions with no brake fade or any other issues slowing the car at these speeds. The floating assembly we supply is also used on the top level V8 racecars in Korea for the past 6 years with no cracking or stress related problems apart from normal wear. We do not see the need to redesign any of the floating assembly as it has proven to be very robust and durable long term in many performance applications. We test all designs on a brake dyno at the Delphi corporation including the floating disc as part of our engineering requirements. The reason I am harping on here is that I am genuinely interested in braking upgrades from the 4 pot brembos, and that includes a bigger thicker 2 piece disc with cooling vanes. Your package certainly appears to meet a lot of my "checklist" requirements, but I am obviously interested in the engineering being up to our local demands here. In terms of testing, nothing beats on road testing in Australian conditions using our heavy vehicles. What has been done by the Koreans in Korea using their v8s in racecars (which would be lighter) etc is not apples with apples in terms of usage in Australia using our heavy supercharged v8s. And using a brake dyno does not equal real life usage high speed on a track/spirited remote canyon run, and some guys here drive their Miamis hard-and they will be the ones looking at a proper brake system upgrade with big discs that are thicker than average 32mm, with proper cooling vanes, and big robust calipers. I was involved in a matter where a Major Korean tyre manufacturer of B double steer tyre maintained that the tyre had been roller tested in their roller shed in Korea and met Australian parameters, and worldwide requirements. Only thing was in our conditions of heat, corners, and rough roads in Northern NSW and Southern Queensland the tyres delaminated. The tyres met all the bench tests- real world delaminated ...and only...in NSW/QLD...not in the Middle East (straight roads etc), nor USA, nor Europe, or Canada, nor Southern America, nor Korea. This front steer tyre delaminated and resulted in a catastrophic failure of a front steer tyre causing head on collision of 2 B doubles in NSW, both drivers dead. So, with that I remain a touch sceptical about bench testing, which still is useful as part of a picture, but look forward to the real world testing in Australia (and try to pick some hot days) of your brakes in our heavy Supercharged Falcons. And I think you should be commended for doing this - our Falcons desperately need a package comprising a disc thicker than 32mm, with proper cooling vanes, and a big robust caliper system- for a competitive price. So please do not take my comments as negative, but rather from someone who is genuinely interested in upgrading their FGX XR8 with your package. Will they come in red paint/black paint, what logos, and again what are the pads - who will make them and what compounds? Last edited by asagaai; 07-03-2017 at 12:07 PM. Brett nice work once again !! piston areas (I gather they are staggered) ? Will they be for sale as a stand alone caliper set as I've got another application in mind ? The dyno test is one of 18 different tests conducted by Delphi for us. With the brake dyno we can simulate road load data from the track and simulate vehicle weight and speeds. Delphi is an OE manufacturer of brake calipers, so have done a great job in developing an OE level caliper and trust there experience during the test phase. We have been testing for quite some time now and also on our Ford Falcon for heavy testing, mileage accumulation on 7 different vehicles. The current calipers we have are black but also looking at silver as it shows the caliper a little better. We prefer not to sell them in red as they are not Brembo's so did not want to use the Brembo color. The option of a logo is up to the customer. We designed the caliper to use a Brembo 6 pot shape pad for ease of availability. The pads supplied with the calipers are from Frixxa in Korea. The pads are a performance pad for street and club day use. We have been using the Frixxa pads since we started selling our brake upgrade with great results. The pistons are staggered and use a Brembo shaped pad so customers can source many brands easily. The dust seals have been designed to meet normal OE requirements. Got mine today. They look huge. Love the black with Shockworks logo. Will get them fitted next Thursday. I'll post a picture when I'm home from work. Looking forward to pics and a review once they're bedded in. I'm guessing you're upgrading from the 4 pot Brembo's on your GT? Are you keeping the old rotors? I've got Shockworks rotors and some stainless lines as well. Just didn't have time to get photos. How much do these cost? Do they come in any other colour besides black? I've been talking to Brett about these for a long time. I'm on my second set of coil-overs. Very happy with the new valving. Didn't get the new color though. Not sure on price, I paid in advance for rear 4 pots to. They were slightly cheaper than brembo's, but these fit Ba bf were as the brembo's are FG. So if you factor in Ba bf brackets they are a lot cheaper. Unsure of colours, I'm hopeful they release them in the silver. As for Price on their FB page, Brett said they would be released at $2500. When the rear is released what will they be retailing for? Hey Brett I hope my rears are black? I really like the black, reminds me of the FG GT black edition. Brakes are getting fitted now. Ill post some pictures when I pick the car up. Hey xexr6t, Yes the rears will be black to match the fronts mate. Thanks Brett glad to hear. Can't wait to get them. My mechanic was really happy with the installation, just like factory. Haven't had much off a chance to test them. Pedal feel and bite are great. I have pictures on my phone but don't know how to put them up, is it possible?